The YWCA of Oʻahu is the oldest continuous service organization devoted to women and children in Hawaiʻi; in 1900, a small group of women met at Mrs. BF Dillingham’s home at Arcadia on Punahou Street to organize the YWCA. From the beginning, the YWCA was organized to provide the working women of Honolulu a safe place to build friendships, develop or maintain solid values and learn skills to become more productive members of the community; but over the years, the vehicles for accomplishing those goals have changed in response to the times. In 1904, the headquarters was housed in the Boston Building on Fort Street. YWCA girls’ basketball team competed with teams from Oʻahu College (Punahou Schools) and Kamehameha. Engleside (the first boarding home located at 251 Vineyard) opened and was jointly operated with the YMCA. By 1906, when it joined the YWCA of the USA, recreational and athletic programs including tennis and swimming classes had been added. The first YWCA residence for young working women, The Homestead (the former Castle Estate on King Street,) was opened and addressed community concerns over the lack of safe and affordable housing accommodations in Hawaiʻi. In 1914, the first Business Women’s Club was established. By 1917, even the Queen was a member of the YWCA. The Red Cross had moved into the YWCA and a worker had been hired to help Japanese picture brides. In 1921, the Atherton family gifted their near-downtown residence, Fernhurst, to the YWCA in memory of their daughter, Kate, and in tribute to her deep interest in the welfare of girls. The original Fernhurst served as a temporary home for as many as 10,000 young working women. As membership and programs grew, a headquarters was needed. Several downtown locations were considered. They settled on a site on Richards Street across from the ʻIolani Palace grounds. Laniākea was the first building of architectural significance in Hawaiʻi to be designed by a woman. Constructed in 1927, it was developed and designed by women at a time in history when there were few opportunities for females to excel in male dominated professions. Ms. Morgan designed over 700-buildings during her 47-year career and ranked the Honolulu YWCA as one of her top ten favorite projects. It immediately became a Honolulu landmark. 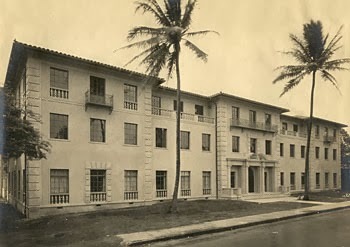 The building’s construction was a crowning achievement for the YWCA of Honolulu, inspiring successive generations of women to rededicate themselves to the cause of community service. The building features the tile floors, roofs, courtyards, and arches characteristic of the Mediterranean style, which the architect chose to adapt to the climate, conditions and materials of Hawaiʻi. Morgan regarded the structure as architecturally “frank and sincere.” She was not given to meaningless ornamentation, yet there is considerable attention to detail, such as the metal ironwork in the balconies overlooking the courtyard and the pool. Sara Boutelle (an architectural historian) judged the Laniākea swimming pool “the most effective of all her YWCA pools,” attributing its success to the architect’s understanding of the contribution of public recreational space to the civic culture and busy lives of women. The “Richards Street Y,” as it is affectionately known, was a meeting place for women of all generations. Popular activities were sewing and lace-making lessons, Chinese cooking classes, girls basketball and ballet. From a place to make tea, eat safely and quietly in the city, and take naps, to a place to make the teapot, close a deal over lunch and swim laps, the YWCA of Oʻahu has been the place for women in Hawaiʻi to find support and encouragement for over 100-years. 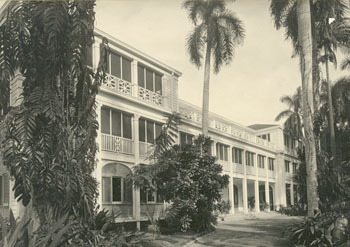 The image shows Laniākea in 1927 (YWCA.) In addition, I have added some related images and maps in the Photos section on my Facebook and Google+ pages. Let’s step back a bit and get some context. William Richard Castle and Amos Starr Cooke founded the Castle and Cooke Company in 1851. Joseph Ballard Atherton began his career as a clerk with Castle and Cooke after coming to Hawaiʻi in 1858. He married Amos’ daughter Juliette Montague Cooke and rose to the presidency of the company, one of the “Big Five” firms that had a major influence on the economy of Hawaiʻi. The Atherton’s home was ‘Fernhurst,’ described above. In 1921, the Atherton family gifted their near-downtown residence, Fernhurst, to the YWCA in memory of their daughter, Kate, and in tribute to her deep interest in the welfare of girls. Earliest classes included English, Bible and lace-making. By 1906, when it joined the YWCA of the USA, recreational and athletic programs including tennis and swimming classes had been added. The first YWCA residence for young working women, The Homestead, was opened and addressed community concerns over the lack of safe and affordable housing accommodations in Hawaii. Then, in 1921, Fernhurst was added to the YWCA. The original Fernhurst served as a temporary home for as many as 10,000 young working women. In the 1940s, when housing was at a premium due to the arrival of civilian war workers, Fernhurst was one of the most active gathering places in the city. Three years later, in 1924, Julia Morgan was retained to design a new main YWCA facility on Richards Street and “Laniākea,” as it was aptly named, was dedicated in 1927. Later, in 1952, the Fernhurst property was sold to the Honolulu Rapid Transit Authority (the site is now the bus transit depot at Alapai and King Streets) and another ‘Fernhurst’ opened at its present location on Wilder Avenue, near Punahou School in Makiki. The Makiki Fernhurst is still operating and offers nightly shared accommodations. Each of the 40 rooms is fully furnished with two single beds, bureaus and lockable closets. Every two rooms share an adjoining bathroom. The image shows the original YWCA Fernhurst building in 1921. In addition, I have added some other related images in a folder of like name in the Photos section on my Facebook and Google+ pages.